How to perform Office 365 Migration? How to Create the Public Folders in Office 365 for a new organization? Why do I need EdbMails Office 365 Migration? Can I test all the features of EdbMails Exchange Migration before buying it? How does EdbMails Office 365 migration work? Is migration between two different Office 365 tenants possible? Does EdbMails support migrations from Hosted Exchange Server? Can encrypted emails be migrated? Standard folders (such as Inbox, Calendar, Contact etc.,) on my source Office 365 mailboxes are initialized with different language. How do I migrate these folders by mapping the respective system folders on target (destination) server? EdbMails does Incremental Migration. Is there a need to migrate a particular mailbox from the same computer during consecutive migration for the incremental check to be effective? Does EdbMails store entire mailbox data on my local computer for incremental migration? I have purchased 100 user licenses for Migration. How does the license work? EdbMails Offers are very competitive and economical. What about EdbMails performance and reliability when compared to other competitors? How to recreate Outlook profiles after the migration? Is there support for migration from a hybrid environment? Are all languages supported by EdbMails? How is EdbMails Office 365 migration licensed? How does EdbMails Office 365 to Office 365 / Live Exchange migration license works? How to Migrate from one Office 365 tenant to another? How can I know the licensed mailboxes used for migration? Does the license includes migration of Contact list, Calendar and Public Folders? Do I need to buy separate license for Public Folders migration? In case of migration failed halfway through, can the same set of license be reused? What if I need license to migrate more mailboxes? What types of data can EdbMails Office 365 tool migrate? Is it necessary to install EdbMails on the source server? Does EdbMails have any size and speed limitations? Is there support for Multi-Factor Authentication in Office 365? Does EdbMails support mapping of source and target mailboxes? Does EdbMails Office 365 migration support Public folders? Is the data on source server affected in anyway when using EdbMails Office 365 migration tool? Can the source mailboxes still be used after migration to Office 365? What if I encounter an error? Click here to create public folders in Office 365. Yes, you can do it in a simple way. Demo / Free trial will migrate 30 items from each and every folder maintaining the exact source server folder hierarchy. You can Migrate 30 items from each and every folders from your Live Exchange server to other Live Exchange Server / Office 365. This means that, if you’re using it to migrate e.g. a user’s mailbox, only 30 emails from each mail folder, 30 calendar items from each calendar, 30 contacts from every contacts folder, etc. will be migrated. Later you can purchase the license for full version of Office 365 Migration tool; you can resume the migration and move all remaining items incrementally. 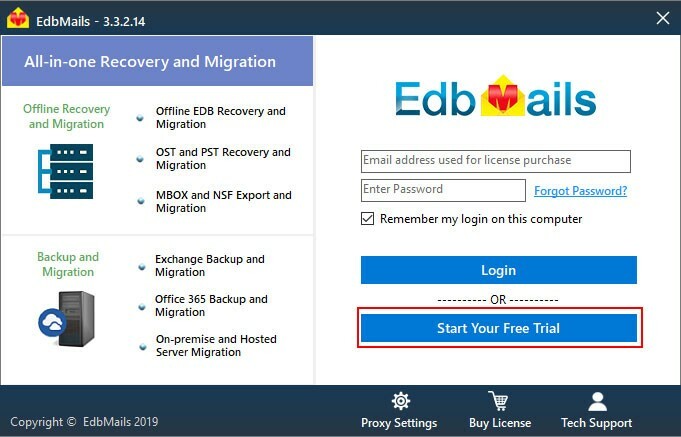 EdbMails Office 365 migration works by accessing the data in the source Live Exchange server and then migrating all this data to your Office 365 user account by making use of impersonation rights granted to a user in both the source server and target Office 365 account. Yes, EdbMails supports seamless migration between different Office 365 tenants which can be extremely useful for organizations in scenarios like mergers. Yes it does. With EdbMails, you can migrate all the mailbox data from your hosted exchange platform (eg Rackspace, Godaddy etc) to Office 365 tenant flawlessly. Yes EdbMails can easily migrate encrypted emails from the source exchange server to your Office 365 user account same as it would migrate normal emails. You can find all your encrypted emails in the Office 365 mailbox after migration. To verify the already migrated data, EdbMails keeps certain metadata details (not the entire mailbox details) on your computer in encrypted format. This metadata details are used for incremental check during migration. Hence, once you migrate a mailbox from a particular computer, during consecutive migration use the same computer to avoid duplicates. However, other Mailboxes that are not been migrated from this computer can be migrated from any other computer in parallel. No. EdbMails keeps certain metadata details (not the entire mailbox details) on your computer in encrypted format. EdbMails only counts source mailboxes that are actually considered for migration. If you migrate above 3 mailboxes to any destination mailboxes (with different domains) for any number of times (for lifetime), EdbMails only counts number of mailboxes used as 3. EdbMails is a user-friendly and most reliable migration application compared to any competitors. EdbMails application is being used by users from more than 150 countries. EdbMails ensures no server downtime during migration, by keeping high performance under every scenario. Your migration data is 1:1 copy of the source, by retaining original folder structure intact. EdbMails does complete migration and we ensures 100% data is migrated. EdbMails migrations are safe and secured as it follows Microsoft recommended flow for migration. 1. Most of the applications fail to migrate if data is not Mime compatible. For this, they will ask you to use Outlook application to migrate the missing data one by one. This is an impossible situation when you have millions of records from 100s of mailboxes. But EdbMails handles Mime and other compatibility issues and it does migration without any manual work. 3. Entire data migration details are recorded (log), to keep the details available to you open. Yes, EdbMails supports migration from hybrid environments to Office 365. Yes EdbMails comes with built in support for all languages and can also migrate special characters. Thus no matter which language your source and destination servers are in, EdbMails can perform the migration effortlessly. EdbMails is licensed per mailbox for Office 365 migration. For example, if you have purchased license for migrating 100 mailboxes and migrated only 50 to Office 365, you can still use the 50 slots you have left to migrate from any Live exchange server to Office 365 tenant. Office 365 to Office 365 / Live Exchange migration license works based on how many mailboxes you want to migrate. That is, if you want to migrate 200 Mailboxes to a different domain then you just need 200 Mailboxes license. And you can use this license to migrate same mailboxes repeatedly for lifetime. You get a list of Mailboxes that are already used for migration. Also you have search option to search the mailbox you are looking for. No. The basic license will support Contact, Calendar, Task, Mail, Public Folders / Archive Folder migration as well. Yes. You can reuse the license for the same mailbox for lifetime. That is, migrate the same mailbox any number of time repeatedly to any destination server / domain without buying any additional licenses. You can easily purchase additional mailbox license through our order page and continue with the migration. 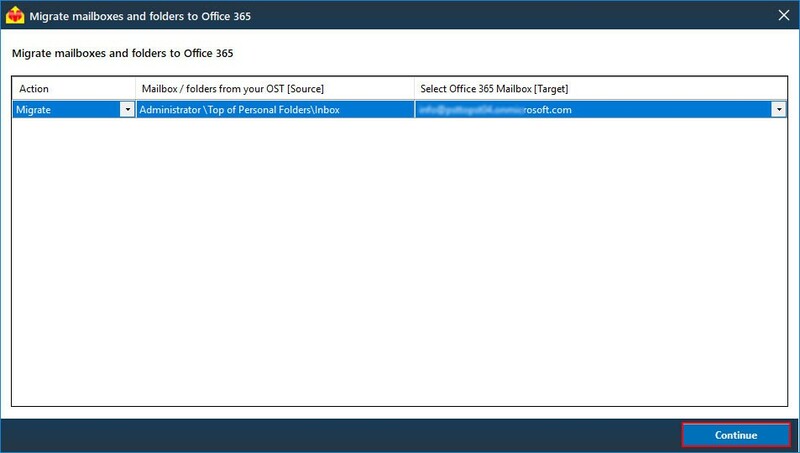 EdbMails Office 365 migration tool can migrate all emails, calendar, contacts, notes, journals, tasks, public folder, archive folder from the source server to target Office 365 tenant. No, you can install EdbMails on any computer that can access the source server for migration to Office 365. No. EdbMails doesn’t have any size or speed restrictions for migration to Office 365. However keep in mind that Microsoft EWS api can limit the migration concurrency (default : 3) or size of the mailboxes (default : 25 mb) that can be uploaded. Other factors that affect speed include type of data being migrated, hardware configuration of the source server, throttling policies of the source server. Yes, EdbMails Office 365 migration tool has support for Office 365 Multi Factor Authentication or MFA. All the data from Live Exchange Server or Office 365 tenant can be migrated to your MFA enabled Office 365 account using the app-password for authentication. 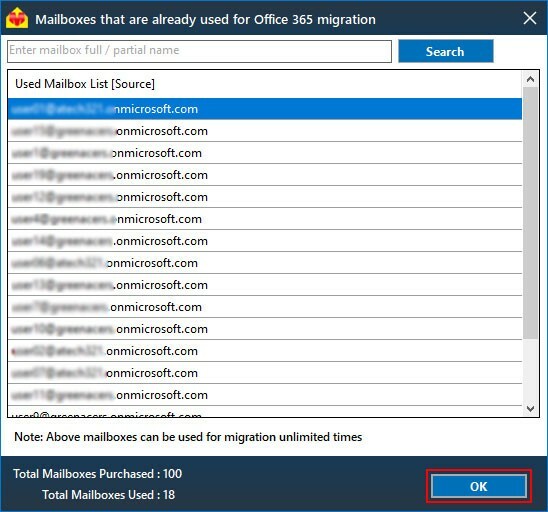 Yes, EdbMails Office 365 migration tool supports mapping of source mailboxes to required target mailboxes of the user’s choice. For this, select the appropriate mailbox from the list of mailboxes/folders that are selected for migration and choose target mailbox from the right pane as shown in the below screen. Yes, EdbMails supports migration of Public folders to Office 365. The Public folder structure from the source server is exactly reproduced in your Office 365 tenant. All you have to do is create a public folder in Office 365 and assign a Office 365 user to it, EdbMails will handle the rest. No EdbMails does not modify the data on the source server in any way as it accesses source server mailboxes only for migrating them to your Office 365 tenant. Yes the source mailboxes can still be used as EdbMails does not alter the contents of these mailboxes during migration. 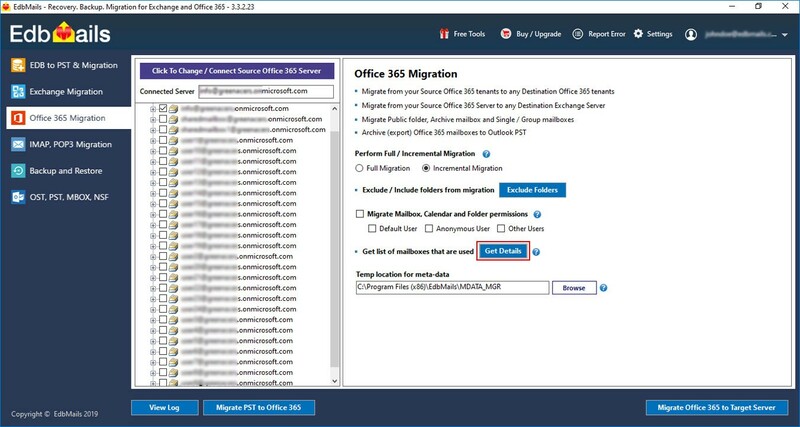 You can even migrate just the new items that are created in the source server to Office 365 using EdbMails incremental migration without having to re do the full migration again. For any queries about using the EdbMails Office 365 Migration tool, please refer to our FAQ page which contains commonly asked questions and their solutions. However if the FAQ doesn’t answer your query or solve your issue, you can contact our Technical support team via email, Live chat or phone 24x7 on all days.